The Walking Leader Course is designed to help expand, amplify, and deliver a greater experience than just the words in the book. The course will go deeper into the 20 Rules in the Walking Leader as well as, offering the tools you can immediately implement to start seeing immediate results and return on your investment. The course is self-paced and can be completed in one day or one year, meaning the start and finish is strictly up to the student’s schedule. This course is for Leaders at all levels. It does not matter if you are an up and coming leader, a long well established leader and everyone in between. The Walking Leader Course is created to help give you an edge over the competition who has either gone stagnant and/or complacent or as still so new that they do not want to make a mistake and then people will not follow them. First off, a leader will make mistakes. That is expected. ALL leaders have made mistakes and will continue to do so. However, what keeps leaders at the helm of leadership is one simple trick. This is really no trick at all but for those that are hungry for some secret tip or simple trick here it is: Leaders remain at the helm of leadership because of how they response to the mistake they made. 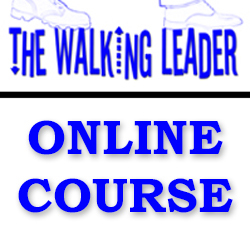 There are no prerequisites to the enroll in the Walking Leader Online Course other than a need to elevate your leadership skills, abilities, knowledge and wisdom. You do not even need to buy the book as you will have access to not just the book’s content but more in the audio and video files.